What we today call the Upper Town is the oldest part of the city, located north from the main city square. There used to be two settlements – Gradec (on the hill Grič) and Kaptol (area around Dolac market and the Cathedral) dating back to the 11th century. 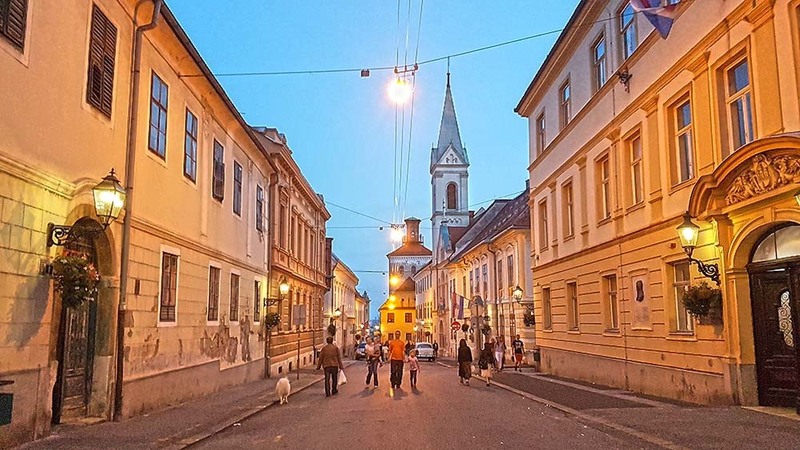 In contrast to the wide boulevards and parks of Zagreb’s Lower Town, the atmosphere of the Upper Town is old-fashioned and it feels like you’ve travelled back through time. Reaching the Upper town on the hill Grič is easy even if you don’t feel like walking up a bunch of stairs because you can use the Funicular. 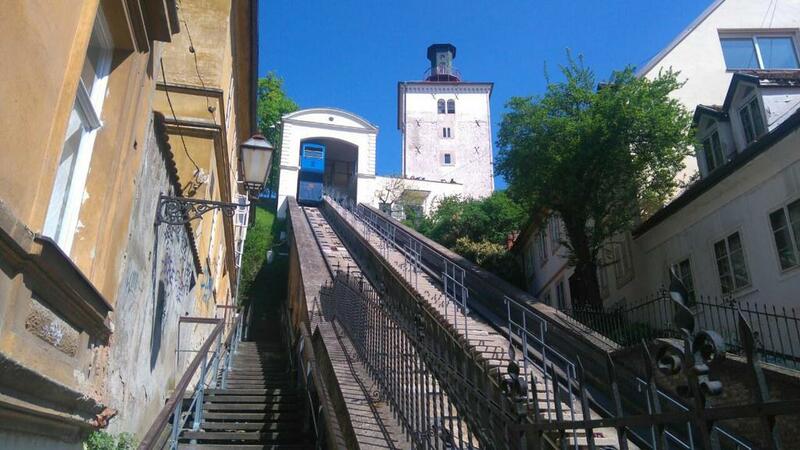 Locals are very proud of their blue funicular and it’s one of the most recognised symbols of Zagreb. Its track is only 66-meters long which makes it one of the shortest public-transport funiculars in the world. And once you ride the funicular and arrive at Upper town, you will have the Lotrščak Tower and its Grič cannon in front of you. The tower used to be a part of the city’s defence wall and later served as a prison. Nowadays, it’s a great viewpoint and totally worth the little climb to the top. According to one legend, a cannon shot from the Lotrščak tower soared over the river Sava and landed in the Turks’ encampment making them decide against attacking the city. Since that shot was fired at noon, the cannon continues to be fired from the same tower at the same time. Next to the Lotrščak Tower is the Strossmayer Promenade which comes alive during the summer with its Strossmartre program that includes a range of music, theatre and entertainment happenings. But the main attraction in the Upper town is definitely the beautiful St.Mark’s Church. 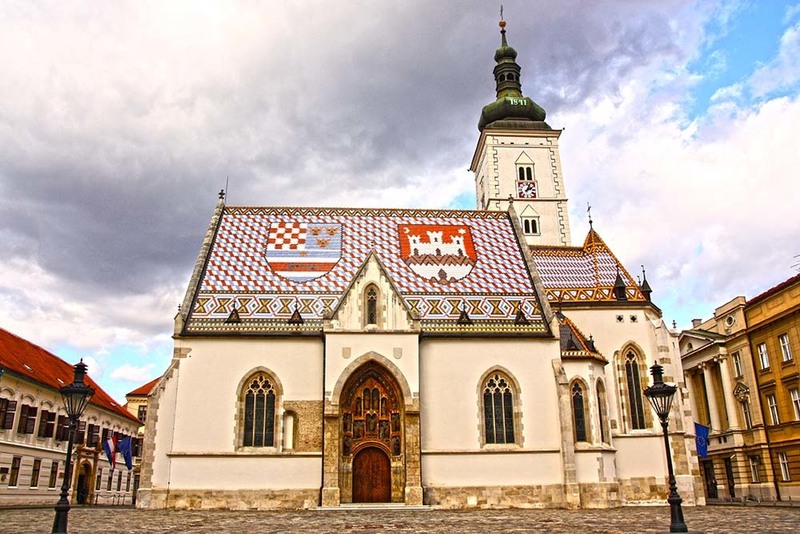 It’s famous for its roof representing the coat of arms of the Tripartite Kingdom (Croatia, Dalmatia and Slavonia) and those of the city of Zagreb. If you’d like to find out more about the history of Zagreb, why not hire a guide? You can do either a classic walking tour or go for a running tour. Check out RunZagreb tours for more information. If you prefer to explore on your own, we suggest using the SightRun App and run (or walk) the amazing Zagreb Must See tour. This tour combines Upper and Lower town and is a great way to combine running and sightseeing. You can download the App on Google Play and App Store and it is completely free! Find out more interesting things about Zagreb on our site Running in Zagreb.